I like sketching churches, especially Russian churches with their onion domes. The Holy Resurrection Russian Orthodox Church in Kodiak is no exception. Often a painting will be fine with just the church, but it’s more fun to add some of the congregation. This small group added sharp contrast and focal point with their black clothes against all the color. 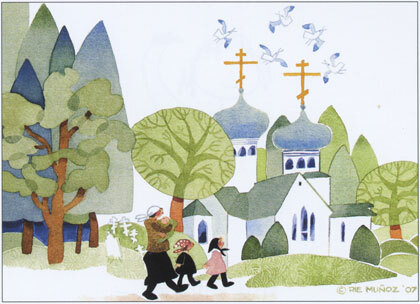 As per Russian custom, ladies attending church wear a scarf covering their head and gentlemen remove their hats. Image: 14" x 10 1/8"
Sorry, we've sold our last one. Please contact us if you would like for us to try to find one for you.